Ali Zaid, a student from Gloucester HS, is the recipient of the highest honour that the Ontario Secondary School Teachers' Federation (OSSTF/FEESO) can bestow upon a student-the Student Achievement Award. Ali won the Senior, grades 9-10 college/workplace division in the prose or poetry category of this prestigious award for his entry entitled, The Fragile Marble. He was sponsored by his teachers Carolyn Turner and Jaana Wissenz. The Federation honoured Ali with the Student Achievement Award by presenting a cash prize of $300 and framed certificate at the OSSTF/FEESO annual meeting, March 13, 2010. - French or English video/audio/animation. Entries are judged at four successive levels: school, district, regional and provincial. The competition is open to all Ontario public high school students. This year's theme was Suppress Excess. The contest was created in honour of Marion Drysdale, who died of cancer in 1983 just after retiring from the position of secretary to the general secretary of OSSTF/FEESO. Drysdale was noted for her keen interest in reading and history. A booklet containing all the winning student submissions can be obtained on request from the OSSTF/FEESO provincial office. A professionally produced DVD about the students and their work is also available. OSSTF/FEESO, founded in 1919, has 60,000 members across Ontario. They include public high school teachers, occasional teachers, educational assistants, continuing education teachers and instructors, psychologists, secretaries, speech-language pathologists, social workers, plant support personnel, attendance counsellors, and many others in education. 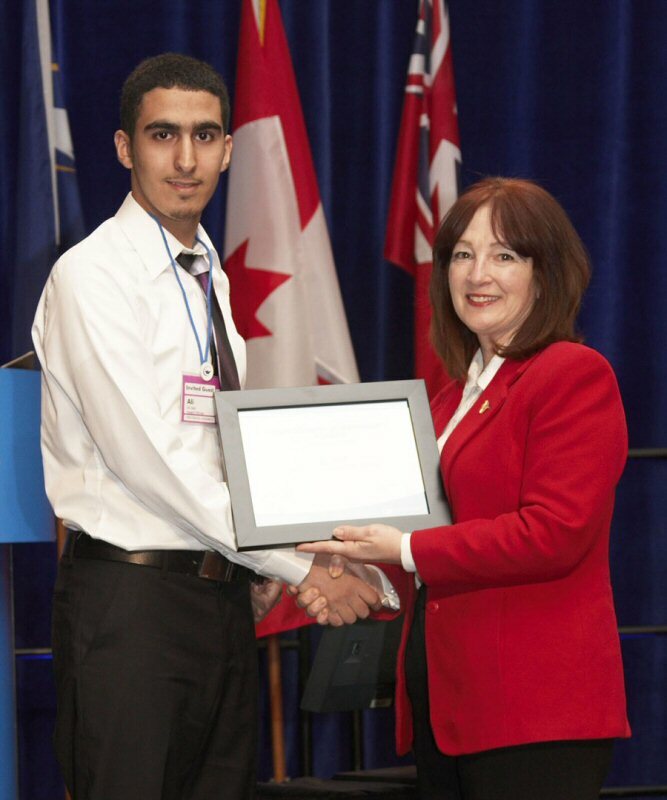 (Left) Ali Zaid being presented with his award with the help of (right) Minister of Education, Leona Dombrowsky.